Welcome to the next generation of Star Trek: The Next Generation, like you’ve never seen or heard it before! For the first time ever, you can experience some of the show’s most important and beloved episodes in glorious 1080p high definition, with true high definition visual effects and digitally remastered 7.1 sound – or with the original audio. You’ll witness new picture detail and depth you haven’t seen before, and enjoy spectacular visual effects that have been painstakingly re-created from the original film elements ... not upconverted from videotape! This “Taste Of TNG” is a glimpse of what the upcoming complete season Blu-ray releases of TNG will be like, and will transport you to the next level. 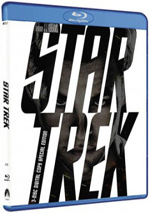 When CBS released the third and final season of Star Trek’s “Original Series” on Blu-ray in late 2009, fans immediately wondered when they would get to Star Trek: The Next Generation. 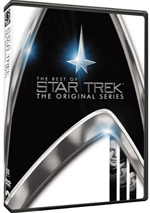 Oh, I’m sure that some also wanted to know when CBS would issue sibling franchises like Deep Space Nine and Voyager, but Next Generation remains the most popular of the Trek spin-offs, and chronologically, it makes sense that it’d hit Blu-ray before the others. After all, Next Generation was the first Trek series after the original, so one would expect it to reach high-def before the others as well. A little more than two years after the “Original Series” finished on Blu-ray, we get high-def Next Generation - well, we get a hint of it, at least. Rather than launch with Season One in all its glory, our first glimpse of Next Generation on Blu-ray comes via a “sampler” disc called The Next Level. 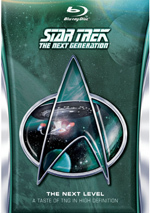 This includes three episodes of Next Generation and as the packaging states, it provides “a hint of TNG in high-definition”. Encounter at Farpoint (Season One) launched ST:TNG with a bang. A double-length episode, this one introduced us to the new crew of the Enterprise in a pretty solid manner. Freshly appointed Captain Jean-Luc Picard (Patrick Stewart) meets and greets his charges. They immediately enter the soup when a powerful being called “Q” (John de Lancie) appears and threatens the ship. He declares that humans are barbaric and challenges the Starfleet personnel to prove otherwise. They have to complete a diplomatic mission to a station called Farpoint, and “Q” will judge the results. Sins of the Father (Season Three) reprised a concept from Season Two’s “A Matter of Honor”. In that episode, Riker (Jonathan Frakes) acted as an officer on a Klingon ship via an exchange program, so the Klingons return the favor here. Commander Kurn (Tony Todd) comes to serve on the Enterprise and generally drives all the crew up the wall with his demands. All except for one: he goes curiously easy on the only other Klingon on board, Worf (Michael Dorn). The latter regards the compliments as an insult and confronts Kurn, who provides the rationale for his behavior: he wanted to test Worf because the two turn out to be brothers! The Klingons feel Worf’s father may have betrayed them at a battle in which he died and the sons were lost, and by Klingon law, the elder brother - that’d be Worf - needs to challenge that judgment and clear his father’s name. The Enterprise jets off to facilitate this matter. Picard orders his staff to use their facilities to research the battle in question to find any evidence possible to solve the matter. “Father” expands nicely on Worf’s backhistory and manages to avoid the soap opera tendencies that might mar such a plot. We learn a little more about the Klingon ways and get good delineation of Worf’s character. We even see Picard go at it with a little more hand-to-hand combat! “Father” offers a tight and compelling tale. A mysterious probe approaches the Enterprise at the start of The Inner Light (Season Five). It sends a beam inside the ship that apparently only affects Picard. He passes out, and when he awakes, he finds himself on a strange planet in the hands of a woman who refers to him as “Kamin”. Her name’s Eline (Margot Rose), and she’s supposedly his wife. Picard/Kamin roams that landscape as he tries to discover where he resides and how he can get back to the Enterprise, even as the years seemingly pass. Meanwhile back on the ranch, we see that Picard remains unconscious, and the crew tries to figure out how to disconnect him from the probe and bring him back to reality. Apparently any time Star Trek moves to high-def, controversy comes along for the ride as well. When “The Original Series” headed to HD-DVD, it did so only with altered – and allegedly “improved” – visual effects. Paramount fixed this for the Blu-ray release, however, as it included both original and “updated” effects. Similar potential concerns confronted the Blu-ray version of Star Trek: The Next Generation - and a new one popped up, as well. In the “related” area, the folks behind the Blu-ray Next Generation needed to figure out what to do with the shows’ effects. Although the series was shot on film, they finished the episodes on video. This meant that although the original live-action footage existed on film, all the effects resided solely in the video realm – video that looked crummy on DVD and would likely look even worse on Blu-ray. To solve the problem, the producers of the Blu-ray went back to the original effects and reshot them. In essence, they recreated the same effects using the old elements, so unlike the computer effects made for the “Original Series” Blu-rays, these didn’t develop anything new. Although I don’t have the Next Generation season set DVDs any longer, I rounded up a compilation with “Sins of the Father” on it and synched it to compare as I watched the Blu-ray. Based on this, I could tell the “recomposited” effects didn’t create an exact replica of the original, but they came very close – and often did look identical. The only real difference I noticed came from an establishing shot of a Klingon vessel; it was seen at a slightly different angle on the Blu-ray. Otherwise, I thought the elements literally recreated the original effects. I’m sure that if I’d been able to directly compare the other episodes, I would’ve found more small discrepancies, but if this was an indication, it seems clear that the refilmed effects offered a very close match to the originals. Even without comparison to the old DVDs, I could tell that the effects remained true in spirit. On the “Original Series” Blu-rays, the new effects stood out like a sore thumb; they never fit into the world of that show. That’s not a problem here. Yes, the effects look good, but they still look like part of their era; they don’t feel anachronistic like the CG material plopped into the “Original Series”. At no point do the Next Generation Blu-ray’s effects feel too modern or out of place. Instead, they seem to be true to their era, and I’ll be surprised to hear of any negative fan reaction to them, as they appear to be accurate renderings of the original material. The new controversy connected to Next Generation on Blu-ray related to aspect ratio. Rumors abounded that CBS would reframe the series for 16X9 TVs, with the idea that no one can stand to watch 4X3 material any longer. Perhaps somewhere down the road we will see reframed Next Generation, but the Blu-ray sticks with the original 1.33:1 image. Well, it gives us a 1.33:1 image; I can’t claim it’s a perfectly accurate replication of the original broadcasts because of the comparisons I made. As I watched “Sins of the Father”, I noticed that the Blu-ray offered tighter framing than the DVD. On the DVD, I witnessed a bit more space around the frame, so we got a little more information on the top, the bottom and both sides. At first I thought this might be due to a little TV overscan, but that would only affect the top and bottom; since the sides of the image get bracketed by black bars, overscan wouldn’t affect those parts of the picture. While I can say that the Blu-ray does frame the image more tightly, I can’t claim that this makes it wrong. It might be, but the image still showed good composition; it simply eliminated some of the air around characters. I’ll leave it to more knowledgeable Next Generation fans to debate the more accurate framing. I wanted to mention the discrepancy but didn't think it was a substantial snag; both images looked fairly similar and the Blu-ray altered only a minor percentage of the DVD’s frame. This part of the discussion has veered into technical elements, so I guess that means it’s time to move ahead to the most important topic: how does the Blu-ray look and sound? 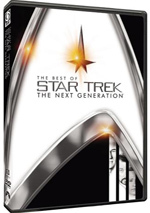 Star Trek: The Next Generation appears in an aspect ratio of approximately 1.33:1 on this Blu-ray Disc. While the shows don’t come free from any concerns, they definitely looked better than ever. My only complaints related to source flaws. Although the programs were usually clean, I saw occasional examples of small white specks. Though these didn’t pop up frequently, I found more of them than I expected; given all the work that went into these episodes, I was surprised to discover any marks of this sort. I did notice that the defects decreased as the years progressed, though; Season Five’s “Inner Light” was by far the cleanest of the bunch. Other than the sporadic flaws, I felt impressed by the programs. Sharpness was generally strong. A few shots seemed a smidgen soft, but those instances appeared to result from the original photography; Next Generation used a fair amount of deep focus, so some loose definition resulted. Overall clarity was very good to great, and I witnessed no signs of jaggies or shimmering. Edge haloes remained absent, and I didn’t see overt signs of excessive processing. Grain remained natural but not too heavy; on occasion, I wondered if some noise reduction was used, but if so, it was applied with a light hand. Unlike the peppy hues of “The Original Series”, Next Generation opted for earthier tones. Though not as eye-popping as those for its predecessor, the Blu-ray brought out the colors in fine fashion. The hues were always full and rich, with good clarity; even the dense reds of the Klingon home world looked tight. Blacks were dark and tight, while shadows showed nice delineation. Because of the minor source flaws, I couldn’t give this one “A”-level consideration, but I still felt impressed by the results. One final transfer note relates to “Sins of the Father”. According to the packaging, “13 seconds of the original film elements for this episode have not been located, and thus have been upconverted from Standard Definition videotape”. I kept an eye out for those 13 seconds and found them easy to locate. They occur at the 30:40 mark when Crusher gets off the lift and talks to Riker. The 13 seconds don’t look terrible, but they do stand out as notably inferior to the true high-def material. As for the DTS-HD MA 7.1 audio of Next Generation, it worked well. While not anything extravagant, the shows displayed nicely involving and broad soundfields. Music showed positive stereo imaging, while effects created a good sense of environment. In the front speakers, we heard a natural and lively atmosphere, and the audio branched to the surrounds well as necessary. For the most part, the rear speakers concentrated on general reinforcement, but they came to life well when necessary and appropriate. As always, audio quality remained positive. Speech seemed distinct and natural, and I discerned no issues connected to intelligibility or edginess. The score sounded vibrant and bold, as the music appeared bright and dynamic. Effects presented solid detail and clarity, and they also offered nice low-end material at times. Ultimately, the audio for these episodes added to the experience. How did the Blu-ray compare to the original DVD releases? Audio remained similar in terms of soundscapes but offered higher quality, as the shows sounded warmer and more dynamic. The improvements weren’t immense, but the DTS-HD material was livelier. The visuals offered by far the more noticeable changes, though. At best, the Next Generation DVDs looked pretty mediocre, so the Blu-ray delivered a radical step up in that domain. You name it and it improved: the Blu-ray provided a huge leap in terms of definition, color vivacity, and depth of blacks/shadows. Even with the smattering of source flaws, the Blu-rays were cleaner; some of those old DVDs got pretty dirty. Taken on their own, the DVDs looked bland; compared to the Blu-rays, the DVDs seemed even mushier and uglier. While future season sets of Next Generation will include extras, virtually none pop up here. The disc opens with a trailer for the Season One release; this also appears under Additional Data along with ads for an iPad app and a “teaser” for the high-def Next Generation. Fans will eagerly greet the Blu-ray release of Star Trek: The Next Generation, and this sampler disc offers a quick teaser. The Next Level provides three episodes – or four, if you count the double-length “Farpoint” as two – in high-definition, and it does so with borderline spectacular results. Both picture and audio are quite good; in particular, the HD visuals demonstrate radical improvements over the flat, mushy DVDs. I’m tremendously pleased by the quality of the Blu-ray Next Generation but not sure to whom this sampler will appeal. Actually, that’s not true; I know that impatient fans will scarf it down rather than wait for the full season packages due later in 2012. But is there any reason to have The Next Level in its own right? Not really. If it’d been a themed set – ala The Best of set from 2009 - it’d make more sense, but I don’t discern a pattern that connects the three episodes found here. Impatient fans should probably just rent The Next Level and save their cash for the season packages.